Yudufreedom.com is a free online document publishing site. You can publish your PDF documents like books, brochures, magazines, reports which is saved in your hard disk and host them online for free using Yudu. Uploaded documents will be are search engine friendly. Your documents will appear in search engines like Google and Yahoo. 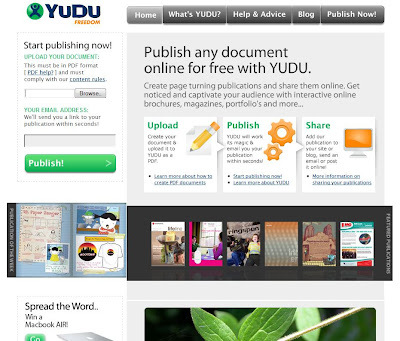 Yudu will not remove links from uploaded documents . Links will remain unchanged if it is live. You can add published documents to your websites and blogs. Yudu is ad free , There is no annoying ads or pop-ups. Upload your PDF document and enter your e-mail, Within few minutes you will receive a mail containing link to your published online document from Yudu .